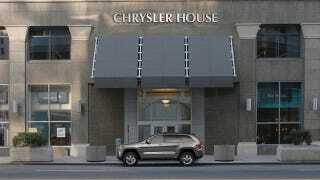 In Detroit this morning, 70 Chrysler employees took up residence in the newly named Chrysler House. It's a historic office building owned by Cleveland Cavaliers and downtown Detroit land mass accumulator Dan Gilbert. The Chrysler employees are getting the top two floors of the 23-story building on Griswold, which was opened in 1912, a dozen years before Walter P. Chrysler officially founded the car company. It's one of the most significant buildings in the city, and was once Detroit's tallest building. The property was designed by Daniel Burnham, the Chicago architect whose famous slogan was, "Make No Little Plans" (certainly a motto with which Sergio Marchionne can relate). Chrysler hasn't disclosed the price of the transaction, but rents in the building generally average $19.50 per square foot, plus utilities. The group that gets to work downtown includes 70 employees from the Great Lakes business center staff and sales people, as well as other corporate functions. There's also a large training room, a state-of-the-art board room that Marchionne will put to good use, and a kitchen. Back when this was announced in April, Marchionne said the offices were meant to be "another step on the path to reviving a great city." They certainly give Chrysler more cred in using "Imported From Detroit" as a corporate tagline, since its American headquarters is in Auburn Hills, a 30 minute drive (on a good day) north of the city. Before that, Chrysler was based in the Keller Building in Highland Park, which abuts the east side of Detroit. And of course, there's the Chrysler Building, one of Manhattan's most famous landmarks, where Chrysler had its headquarters from 1930 to the mid-1950s (the Chrysler family sold the building in 1953). Gilbert's role in creating Chrysler House can't be understated. When he heard Chrysler was looking for downtown space, he leaped at the opportunity to attract a high profile tenant. Through his real estate company Rock Ventures LLC, Gilbert has spent $300 million to buy more than 2 million square feet of office space and 1 million square feet of parking lot space downtown. according to Forbes. He's getting it at bargain basement big city prices of as little as $5 a square foot. It's easy to wonder whether the Chrysler-Detroit romance will be a fad that ends as fast as Call Me Maybe parodies, or whether Chrysler actually will make a long-term commitment to operating downtown. In case you think that's too pessimistic, just remember this is a company that's had four different sets of owners in the past dozen or so years. Marchionne may be dedicated to a Detroit comeback, but there's no certainty beyond him. We like seeing Detroit get some love. We just don't want it to be loved and left. The next, most meaningful step for Chrysler would be to move all those folks from Auburn Hills to downtown. After all, if its cars can be imported from Detroit, the rest of Chrysler can be, too. Does Anyone Use Megabus? Yay, Nay Or Meh?